Bring a large pot of lightly salted water to a boil. 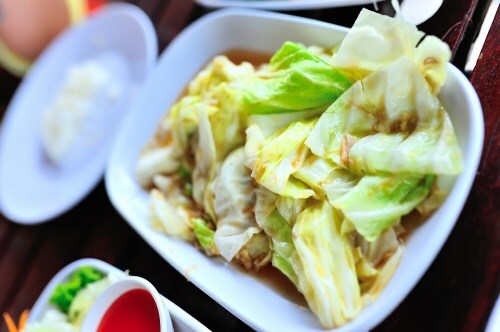 Blanche cabbage briefly in boiling water, remove and drain immediately. In a large skillet, brown bacon over medium heat until opaque; remove and drain on paper toweling. Remove all but 1 tablespoon of bacon grease from the skillet; add the 1 tablespoon extra virgin coconut oil and heat over medium heat. Add onion, celery and bell pepper and saute until crisp-tender. In a large bowl combine the prepared cabbage, bacon, sauteed vegetable mix (with oil), vinegar, salt and pepper. Mix well and serve warm, or chill and serve later.